Chronic foot and toe pain affect an incredibly large part of our population. We spend hours on our feet daily while working, playing sports, shopping, and also while trying to reach that goal of 10,000 steps a day. Each of those steps generates a force on the foot. During an average day, the feet support a combined force equivalent to several hundred tons. Therefore, it is not surprising, that the majority of Americans experience foot pain at some point in their lives. Sometimes our choices of footwear lead to foot pain or even chronic foot or toe conditions. Improper foot mechanics with walking, running and intense training can also cause problems with our feet. Various physical conditions such as high arches, fallen arches, degenerative arthritis, bony abnormalities, foot pronation (flat-footedness), inflammatory joint diseases and excess weight are some other mechanisms of foot pain. However, underlying joint instability of the feet and toes is an often overlooked cause of many painful foot conditions. Understanding joint instability in the foot and treatments that are effective at reinstating stability can help you overcome foot pain once and for all. The foot, if we include the toes and ankle, contains 26 bones. All of those bones make up 33 joints supported by more than 100 muscles, tendons and ligaments. When there is insufficient ligament and tendon support to stabilize the motion in those joints, the joint becomes weak or lax, resulting in instability. Joint instability typically begins with an injury to the ligaments and tendons supporting the joint. (See Figure 1.) Because the joint is no longer held in place by healthy ligaments and tendons, unstable joint motion develops and eventually exerts abnormally strong pressure through other areas of the foot. 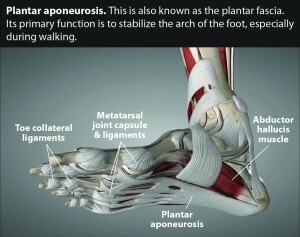 Morton’s neuroma, a fibrous tissue formation around nerve tissue in the intermetatarsal spaces of the toes with symptoms that include sharp pains, burning sensations, and paresthesias (abnormal sensations), is not traditionally thought of as being an instability problem. However, injury to ligaments of the foot, such as the transverse metatarsal ligament, can cause excessive motion between the metatarsals, causing irritation of the bursa or a nerve, and result, for example, in a significant enlargement of the 3rd common digital nerve. (See Figure 2.) This enlargement can cause further trauma, worsening the symptoms, which can be quite severe. Morton’s neuroma most often affects women who frequently wear pointed, high-heeled and close-toed shoes, the mechanics of which transfer body weight to the metatarsal heads, placing undo force on the stabilizing structures there. Bunions are another widespread chronic foot complaint, also commonly seen in women. This growth in boney tissue occurs mainly on the medial side of the foot, producing the characteristic bump or bunion. Joint instability here is characterized by medial deviation of the first metatarsal and lateral deviation of the hallux. This shift leads to the formation of this boney projection on the medial side of the toe in an attempt to stabilize joint motion. Hallux rigidus is a condition caused by degenerating cartilage in the metatarsophalangeal (MTP) joint, which eventually leads to osteophytes (bone spurs) forming around the joint—a last ditch effort of the body to recover joint stability and stabilize the joint. The underlying condition of both bunions and hallux rigidus is instability that causes osteoarthritis of the MTP joint. Abnormal joint shifts precipitate the pathological bone growth associated with bunions, reducing movement in both flexion and extension, thus leading to hallux rigidus and to a potentially frozen joint. Though most people with foot pain have tried orthotics and pain medication, along with a severely altered activity level, these solutions do not often provide long-term relief. When foot and toe pain continue, surgery is frequently considered. In fact, surgery on the first metatarsophalangeal joint is amongst the most common surgery performed. Despite the commonality of these treatments, a large percentage of people continue to suffer with foot pain. An effective non-surgical treatment for long term reduction and elimination of this pain is Prolotherapy, a natural regenerative injection treatment. Prolotherapy addresses the underlying cause of the problem, joint instability caused by ligament and tendon injury. By strengthening ligaments and tendons, Prolotherapy can stop the pathologic cascade causing a myriad of foot conditions, stabilizing the joint and bringing pain relief. (See Figure 3.) If you have had long term foot pain, and feel you have tried everything, consider a Regenerative Medicine consultation for Prolotherapy.